SACRAMENTO (PAI) — Calling the legislation unbalanced, Gov. Jerry Brown, D-Calif., vetoed legislation, pushed by the United Farm Workers, that would let a state board implement union contracts with growers, through mediation, even if the growers appealed. The measure would have removed one roadblock growers use to prevent contracts with workers, primarily represented by UFW, from taking effect. UFW had no immediate comment on Brown’s veto, but the governor’s name was notably absent from the union’s endorsement list for this fall’s election. UFW endorsed his running mate, Lieut. Gov. Gavin Newsom. 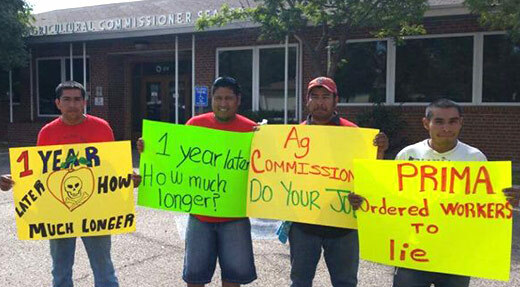 Photo: Gerawan workers demonstrate over pesticide exposure incident at Fresno County Ag Commissioners office, September 26. UFW, Facebook.